Thank you to Au Courant friend Isabel Graubart for contributing this travel post! After spending three weeks in Myanmar, Laos, and Cambodia, it’s safe to say that Southeast Asia was one of my favorite places to travel. And although I cannot pinpoint one favorite moment or place from this magical trip — as each was so rich and unique — I am excited to share some highlights of places to stay, excursions that cannot be missed, and best ways to travel throughout the countries. Myanmar the Southeast Asian nation formerly known as Burma, is bordered by India, Bangladesh, China, Laos, and Thailand. In order to best experience the quaint, local villages of Myanmar, I recommend traveling by River Boat. 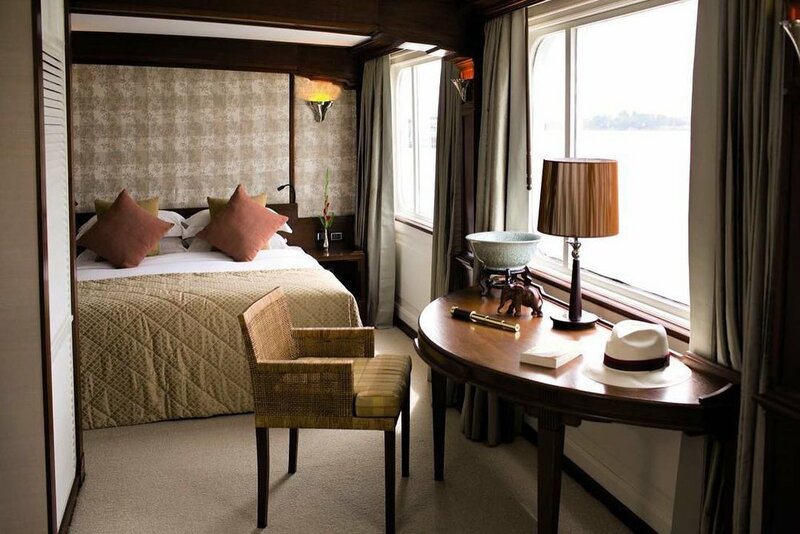 The Belmond Road to Mandalay is an intimate, tranquil and indulgent experience down the Ayeyarwady River. Over the span of 5 days, guests are invited to recline on the top deck by the pool, settle down with a cocktail at the Piano Bar, enjoy a starlit dinner with world-class chefs, or treat themselves at the spa. In between all of this, you can spend daytimes biking through Bagan, learning to make peanut oil with a local, exploring charming fishing villages, hot-air-ballooning over the thousands of temples of Myin Mu and waking up at sunrise to feed the monkeys. Or, if putting your feet up is your preference, you can simply sit on the top deck and sip local wine while watching the Pagodas (Buddhist temples) pass by with a sunset filling the background. It can be just what you need to feel connected again. Nestled in Luang Prabang, a northern Laotian city known for its many Buddhist temples, lies the lovely Amantaka. What used to be an old provincial hospital has been transformed into a beautiful, French colonial-style, white-walled and greet-shuttered, tropical property featuring 24 private suites. 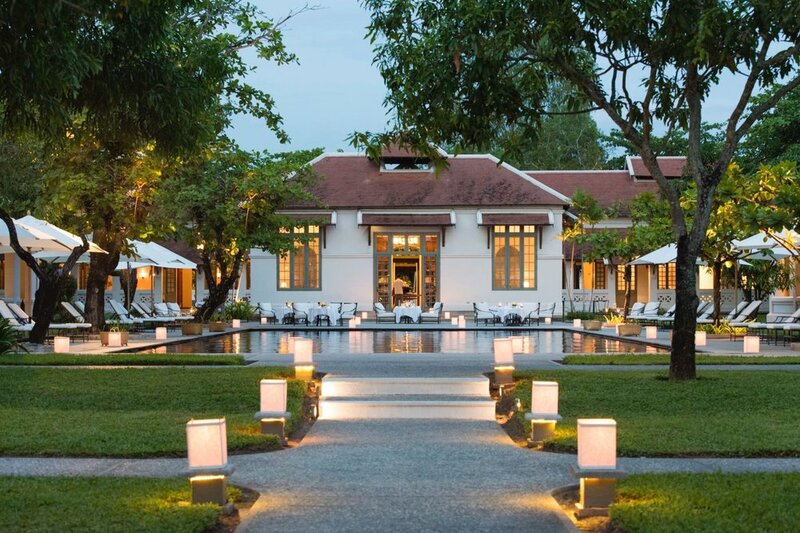 Filled with Southeast Asian wood furnishings and captivating photographs featuring Buddhist monks, Amantaka is just a few minutes walk from the Mekong River, as well as charming boutiques and the town’s famous night market. After long days of exploring the temples by foot, we loved jumping into the swimming pool and lying in the grassy courtyard! Be sure to check out a Laotian cooking class, take a bike through the countryside to discover local pottery, and visit the Mandalao Elephant Sanctuary. Don't forget to try the tasty mango sticky rice! Perhaps my favorite hotel we visited on this trip was Phum Baitang, located in Siem Reap, Cambodia. Situated on eight acres of beautiful gardens and rice fields, Phum Baitang is a stunning hideaway with a modern-yet-authentic feel, featuring farmhouse architecture and exquisite design details throughout. 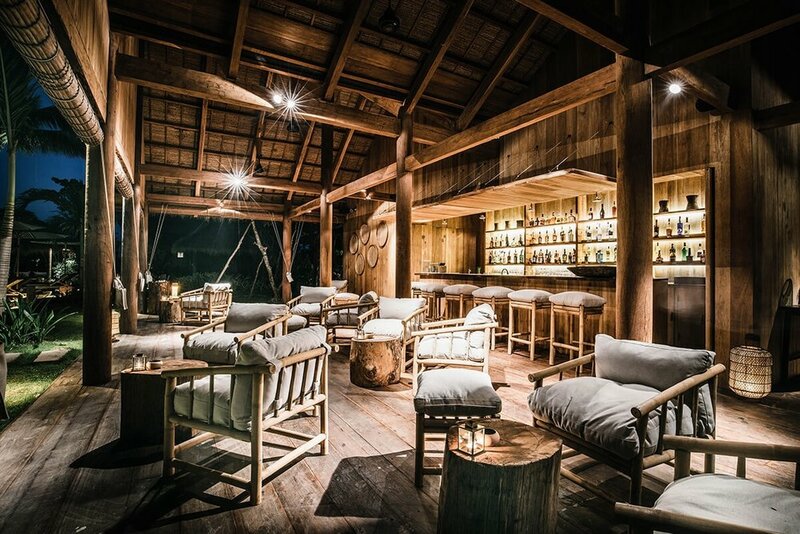 The resort includes 45 stilted wood villas, inspired by traditional Cambodian design and enhanced with local décor. The restaurant, Bay Phsar, serves flavorful farm-to-fork foods glorified with local ingredients and spices. Each night, we enjoyed relaxing at the villa-style Cocktail Lounge and eating dinner outside in rattan chairs with a beautiful view of the rice fields (just to remind you how fresh all the cuisine is here!). Mornings consisted of waking up with healthy juices inspired by seasonal ingredients and afternoons were spent at Angkor Wat (or early morning if you go in the warm season), and relaxing by our villa’s pool with the chef’s daily popsicle or surprise treat. It is impossible to not fall in love with Cambodia while staying at Phum Baitang.